The BMW Z4 has been making waves in the luxury automotive market since it first started production in 2002. The rear-wheel drive sports car was created by the German automaker to replace its outdated Z3 model. The Z4 was produced as both a roadster and a coupe, and it immediately garnered the attention of car enthusiasts around the world. In the year it debuted, the BMW Z4 won the “Design of the Year Award” from Automobile Magazine, setting it up for guaranteed success in the years to follow. One of the most appealing aspects of the BMW Z4 is that it is a sports car in convertible form. Thanks to BMW engineering, the hard top on the Z4 works with the car, to allow for maximum performance, without sacrificing the convenience and fun of a convertible. The 2015 Z4 is geared towards the driver in every possible way, and delivers a performance worthy of every accolade it has ever received. The 2015 BMW Z4 is available in three varying trim levels, ranging from basic amenities to extreme luxury. Everything about the 2015 Z4 promises to bring out the child inside, who is begging to come out and play. It is without a doubt that the 2015 Z4 is a fun car. While other convertible rivals stop at the fun element, BMW takes it one step further and offers an exhilarating sportscar performance on top of the convertible’s appeal. The unique hardtop featured on the 2015 Z4 was meticulously designed to ensure performance, and convenience. The true hardtop can both open or close in only 19 seconds, and even manages to do so at speeds up to 25 miles per hour. If you head out not expecting rain, and it happens - you will barely have to slow down to secure yourself and your Z4 safely from the elements. Whether you are experiencing the 2015 Z4 with the top up or down, the sporty convertible looks great either way. An elongated hood meshes perfectly with the body of the car, and presents a unified progression from the front, all the way to the rear bumper. The athletic, lean tone on the exterior of the 2015 Z4, gives it a true roadster look, that other convertibles in its segment are missing. Whether you are looking for a fun roadster to cruise the open road with, or a high-performance sports car, the 2015 BMW Z4 gives you options. At the very heart of the Z4, are three engine options, all of which deliver the high performance experience BMW is known for. Check out each engine option below, and discover what each one offers. 28i - This inline 4-cylinder TwinPower Turbo engine achieves 240 horsepower, and 260 lb.-ft. of torque. It features BMW’s High Precision Direct Injection, Double VANOS, and Valvetronic technologies and is more fuel efficient than the engine it replaces. 35i - This engine is the next level up on the power and performance scales. The inline 6-cylinder engine features 300 horsepower and 300 lb.-ft. of torque. It features the same advanced performance as the 28i, as well as increased fuel economy and a quicker response time. 35is - For ultimate power and performance, this mighty engine offers an impressive 369 horsepower and 332 lb.-ft. of torque. That kind of power means going from zero miles per hour to sixty miles per hour, in just 4.8 seconds. On top of the high performing engine options, drivers can choose from a list of other performance-minded technology. A 7-speed dual clutch, a 6-speed manual, or an 8-speed Sport automatic transmission are all options that drivers can choose from, to help make their Z4 more unique to their tastes. All three engines offer BMW’s advanced sDrive, an advanced rear-wheel drive system that allows for near-perfect weight distribution, which is complemented by BMW’s Adaptive M Suspension, for a smooth and dynamic ride, every time. Cornering Brake Control, or CBC, is also incorporated into the Z4, giving it increased stability while taking sharp turns, and works independently from the anti-lock braking system on the 2015 Z4. The 2015 BMW Z4, is a refined sports car, meant for drivers who crave open-air excitement, as well as interior luxury. Each Z4 model carries the high standard of quality and amenities that BMW is known for, and it shows. Discover each trim level below, and a sampling of the amenities each one offers. sDrive28i - Starting under $50,000, this Z4 model comes with the base engine offering, and is the only model available with a manual transmission. The 17-inch star spoke alloy wheels bring the exterior together, while advanced Xenon Adaptive Headlights with auto-leveling and LED headlight rings, help you stay focused on the road ahead. Ten-way power adjustable seats with a 4-way power adjustable lumbar support system, ensure you and your passenger will be riding in comfort. For convenience, this model features a keyless ignition, rain-sensing windshield wipers, and an automatic dimming rear-view mirror. For drivers who appreciate ease of connectivity, the standard Bluetooth phone and audio system are a welcome addition, and can be easily accessed via the 3-spoke leather-wrapped multifunction sport steering wheel. sDrive35i - With a starting MSRP of $56,950, this model features a 6-cylinder engine and impressive amenities. Included in this model are 18-inch wheels, and a unique sport seat that comes trimmed in sun-reflective leather. Both of these amenities do not come standard on the 28i, and are a part of what makes the 35i stand out on its own. 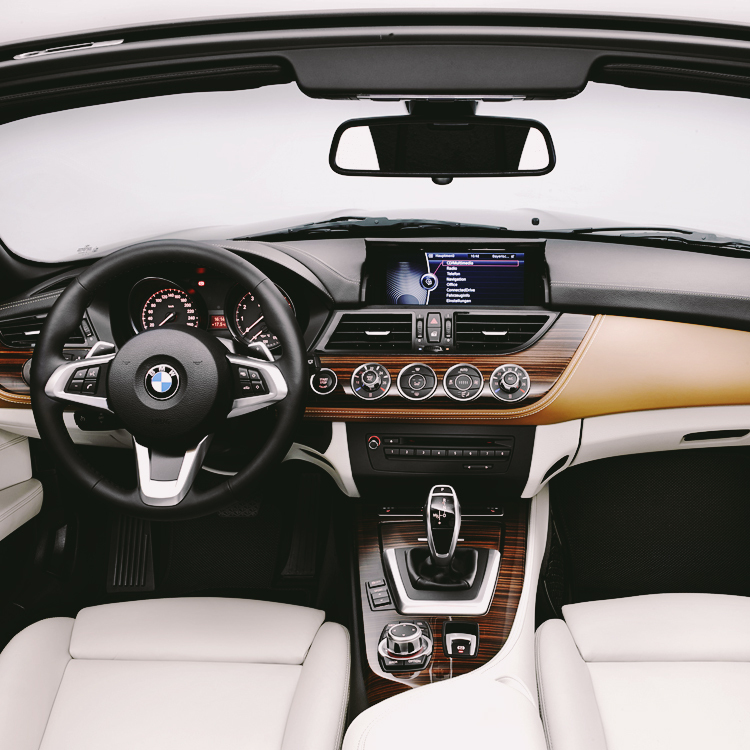 White side-turn signal indicator lenses, Kansas Leather upholstery, and BMW ambiance lighting, are all extras that are not offered on the lower trim level of the Z4. sDrive35is - Featuring the most power at 335 horsepower, and a more aggressive suspension, this high-end trim level pulls out all of the stops for a starting MSRP of $65,800. The 35is features an all-around sportier trim, Driving Dynamics Control, an Aerodynamic kit, and a premium sound system, that all help it stand above other Z4 trims.